Well surprise, surprise. Those mean looking creatures take pleasure from the joys of cooking. Glu Games is at it again, this time with a free-to-play iOS and Android release called Tavern Quest. 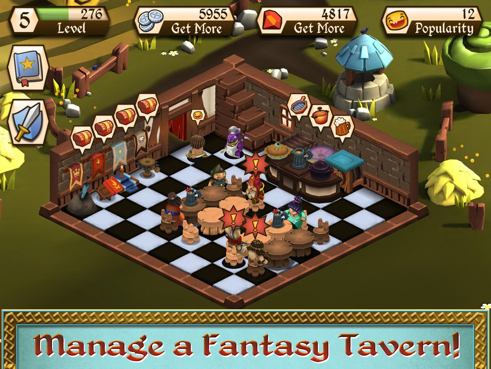 The game lets users build and then customize their own taverns, but there's a layer of strategy that could make this a mobile favorite. From what we've heard, players can collect more than 50 different heroes and then send them on quests to defeat villains. But wait, there's more. The star of Tavern Quest is a dragon with a love of cooking. Bullied by bigger and meaner dragons, he vows to get even, not just with those aforementioned heroes, but also from discovering and then making new dishes. Yup, another mash-up game, and we couldn't be happier. It's great to see developers coming up with new ideas instead of rehashing the same freemium concept. That said, the game should be available today/tomorrow, and we'll let you know if Tavern Quest is worth your time later this week.